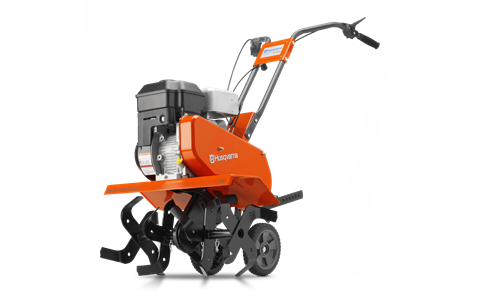 The Husqvarna FT900 is a front-tined tiller/cultivator that is best suited for small-scale landscaping projects, such as preparing flower beds and garden patches, and is a superb choice for the majority of home owners who require performance and reliability at a reasonable price. This is the smallest in the range but is quite capable of dealing with the majority of garden terrain. The tiller features a 26-inch working width and 6.5-inch working depth, with 6 adjustment steps. It is powered by a 205 cc Briggs and Stratton 900 OHV Series overhead-valve engine with a 9-pound torque, which is complemented by a chain gear transmission. The FT900 includes one power forward and one power reverse gear which allows for easy maneuverability and transport to your working area, and the gears are mounted on the handlebar for easy access. Additionally this model is equipped with carrying handles for easy handling both before and after use, and it includes an easy-adjust drag bar for balance in different working conditions. Other features include 2 transport wheels and a vertically adjustable handlebar. Tillers and cultivators are strictly speaking different machines capable of handling different types of terrain but several manufacturers now produce a combination tiller/cultivator. These machines can be used for deep tilling and gentle cultivating, thereby reducing the need for a host of garden machines.